With a stay at Seine en Bulles in Merrey-sur-Arce, you'll be next to a golf course and within the region of Golf de l'Ermitage and Cheese Museum. Free self parking is available onsite. 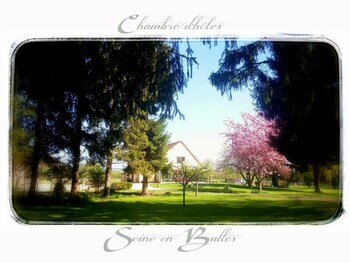 With a stay at Hostellerie des Clos in Chablis, you'll be within a 10-minute walk of La Chablisienne and Domaine Servin. Free self parking is available onsite. Located in Gennevilliers, ibis budget Gennevilliers Asnières is within a 15-minute drive of Stade de France and Grande Arche. Free self parking is available onsite. Located in Strasbourg, Hôtel Vendôme is within a 15-minute drive of Covered Bridge and Alsatian Museum. Featured amenities include a 24-hour front desk and a safe deposit box at the front desk. Located in Forges, Auberge de Forgès is within a 15-minute drive of Saint Pierre Church and Jean Saintangel Garden. Free self parking is available onsite.